Everyone wants opportunities in their career. I was at an industry event and everyone on the panel was wonderful and knowledgeable. But I noticed, so was the audience. Remember, at some point the ones on the panel had once been in the audience too, but were able to move through many doors with success. We can sometimes be more impressed with a position of status and forget that there was often much effort made to get there. The world is filled with doors of opportunity; we walk through them all through our lives. Of course they are not just physical doorways, but doorways through our relationships, our success, and our growth. There are times of great spurts of growth in which we may even move through a few doors at a time. Each doorway presents an opportunity to resist or shift; when a door opens, it offers a passage of change. Often a door will take us from the unknown to the known. But sometimes a doorway is part of deepening a relationship, or a commitment to our craft. 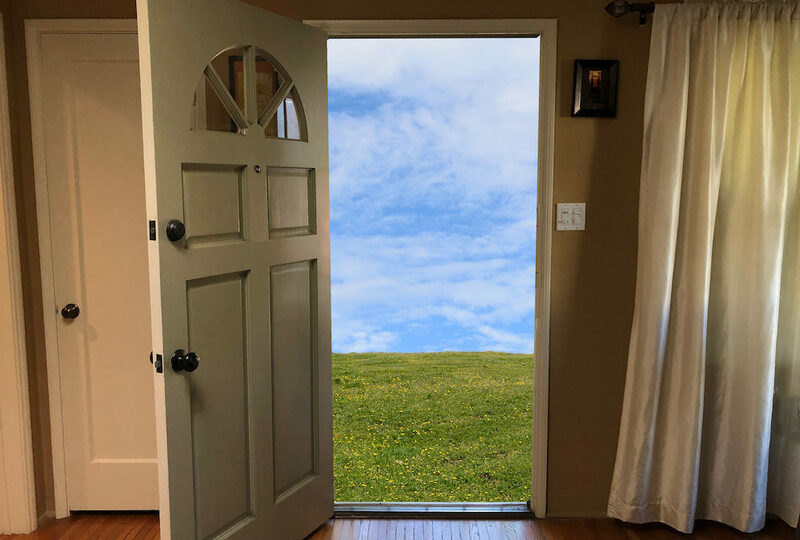 The doors in our consciousness are very powerful, they can close when we are afraid or they can open when we allow ourselves to move past our fear. Every person you meet in this field, from every fellow actor, to every casting director, PA, producer, everyone you encounter is a movement through a door. And these doors build energy inside our world, create momentum, and feed into how we go about our lives, with joy or with anger… with kindness or darkness. To open a door, you must ring a bell, or a buzzer or knock, so someone can open it. No one will know you are there waiting, if you don’t knock and make yourself known. This is where desire to meet your goals stand, between you and the door. Often with the unknown we feel fear. We wait, we wonder, what will happen, will we be received? Will they be genuinely glad to see us? Or will the door open and then abruptly close never to open again? This is the dilemma. Will we be rejected or accepted? Will we survive the door? But every door actually has access to a powerful source. Often when we make that call, or email or reach out to someone who could potentially improve our career, we experience fear, and that fear projects an agenda, tied with expectations along with desires to be appreciated, loved and accepted. But what if instead of fear, we knocked without an agenda, without expectations, without the need to be accepted and without rejecting ourselves? What if you gave yourself the love inside that you long to get from the other side of the door? You might be equating that getting success means getting love, but neither are the same. Take the need to be loved out of the need for success. To be daring, to take risks as an actor, you aren’t always going to be accepted, even from those you love. Imagine opening your heart anyway. Just a little to let some love inside, just an instant prior to every encounter, perhaps we would be more kind to ourselves and others and our path might ease. And in doing so the knock at the door might become a more genuine one, a more loving one, a little more open and a lot more accepting of whoever is on the other side. With a little piece of love we could improve every encounter, every movement through each door. It might feel hard to walk with a piece of love. People might bully you, they might not accept your work, they might criticize you, spread lies, betray you. But you will be able to keep going if you cleanse yourself of their misfortunate thoughts and actions, because they suffer more than you. They might not see that doors are symbols to protect what is inside, and that love can make it safer for you to enter. They still might not accept you, but you can accept yourself. Because the truth is, being an artist isn’t about pleasing every person behind every door, it’s about working until the doors open without you having to knock. How to feel more love. Every day remind yourself of things that bring you joy, that you can appreciate without any agenda. It could be chocolate, or puppies, or music, or art. I love nature and sometimes find myself leaning up against a tree with appreciation. All you need to do is take a minute. Close your eyes and appreciate something. Then turn that appreciation to yourself. Appreciate your journey and appreciate that you’re willing to be as open as the door you are walking through. I also realized the trick with love is, that you have to reach into your heart for it. It doesn’t matter who you are, how many advantages or disadvantages you have had in life, love is not discriminating, it’s there for all of us. We just have to stretch our hearts a little to let it out. By opening your heart when an opportunity is presented, you have a better chance of making use of the moment, because you will be coming from a little piece of love. To do this you need not get in your head, as you must surrender any attention to the results. Why, you may ask? Because on the other side of the door is another heart, whether or not they are aware of it. And that release of agenda, allows for the potential of a human-to-human connection, which is where miracles happen in their own time. Finding the doors and keeping them open means consistently working on your craft. Strengthening your skill, working through fear, working to become more directable and more useful, as you bring more of yourself to the work, primes you to make the most of each opportunity. And by stretching yourself in the art, you are practicing stretching your heart, as you bring a little piece of love through every door. Here are resources on my website to be used for finding and opening doors.